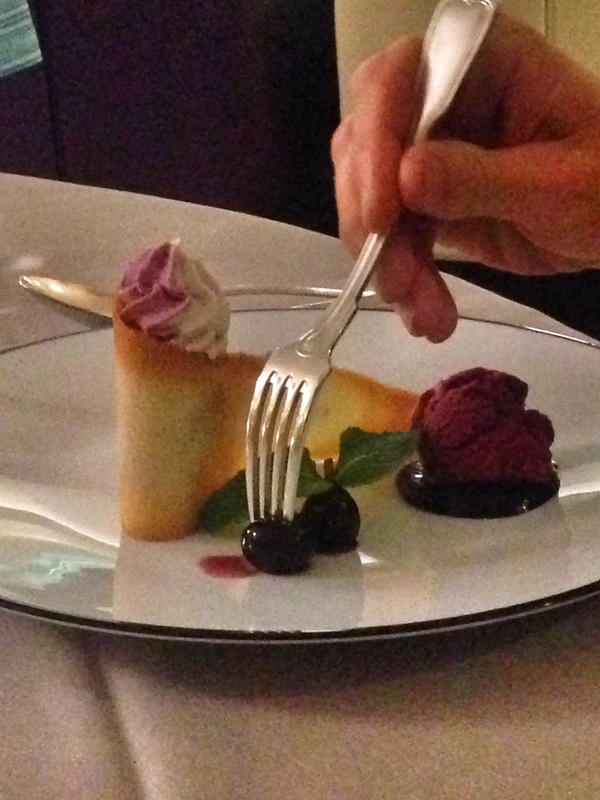 In this post, I’m combining a couple of meals that we had in the restaurant in our hotel in Compiegne, France – the Hôtel du Nord. We arrived into France late on Tuesday evening and decided to have dinner at the hotel rather than going out. It was a very good choice! We also had lunch there on Thursday because we were meeting in the conference room at the hotel all day. 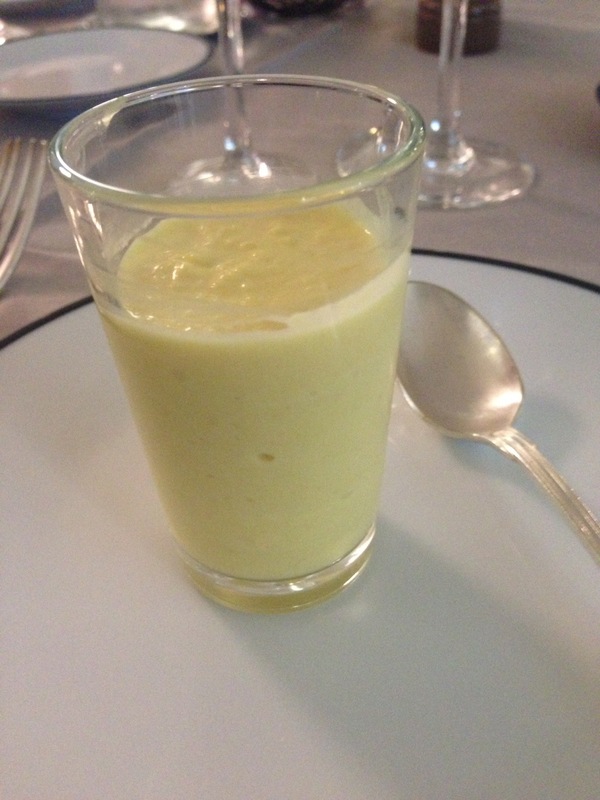 At dinner, we started with a les amuse-bouches (appetizer) of Brussel sprout mousse. It sounds strange, and it was a bit peculiar, but it was also surprisingly tasty! But, then again, I love Brussel sprouts! Then, I had a traditional Filet Mignon with crispy polenta and mixed greens. It was nothing fancy, but it was a good, solid, and well-prepared meal. I didn’t partake in any extra appetizers or dessert, but I thought I’d share pictures of my coworkers’ dishes, because they are so beautiful! 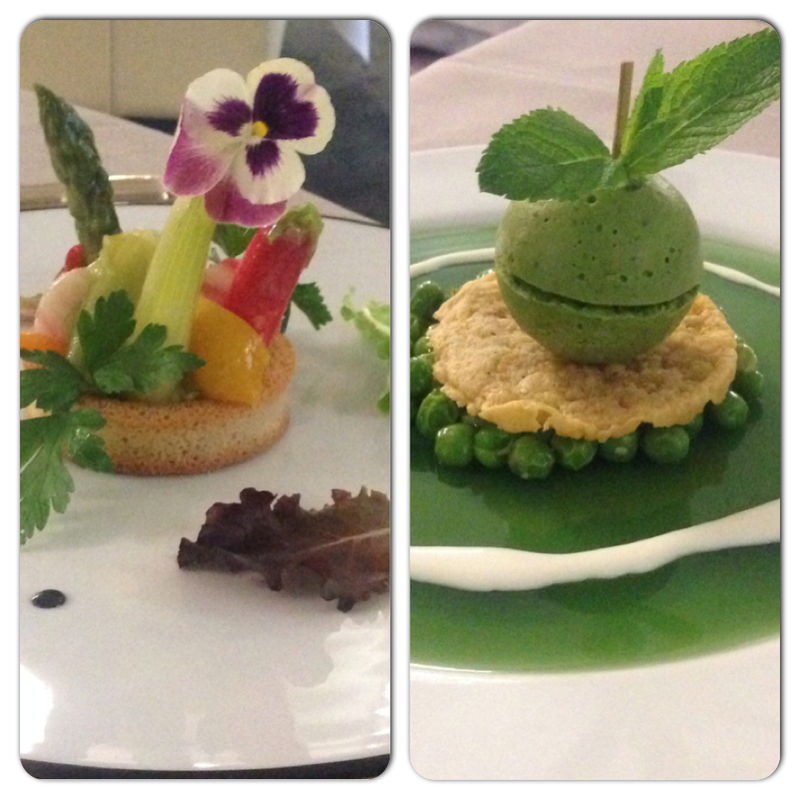 Appetizers: vegetable torte on the left and avocado and green pea starter with a mint jelly base on the right. The French certainly do know how to innovate food with flavors and design! For lunch, we had a set menu which was all a surprise to me because I don’t understand French! 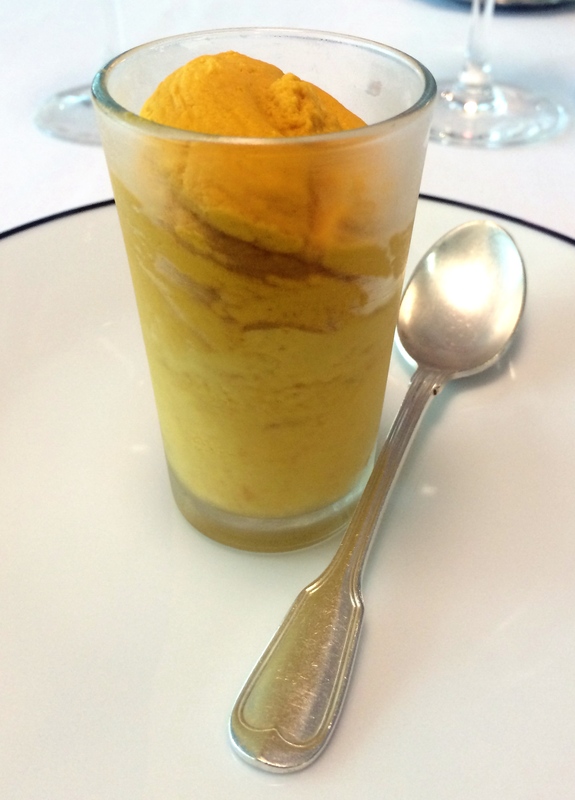 We started with a layered carrot mousse with ginger cream. Again, it’s an interesting flavor and texture, but we all agreed that we liked it. After the small plate (errr, shot glass! 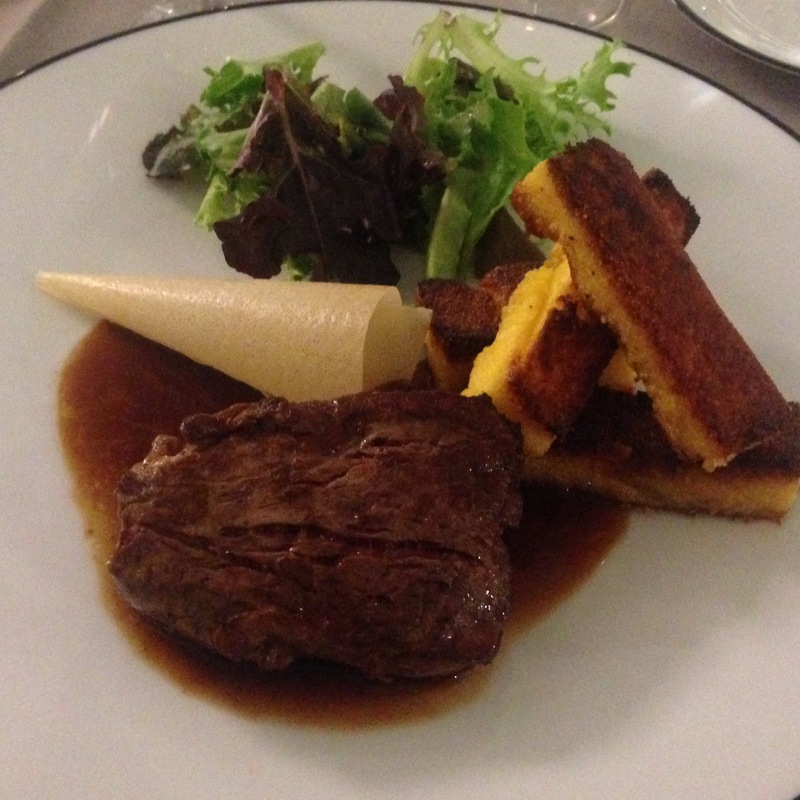 ), we were served the classically French appetizer of Foie Gras. 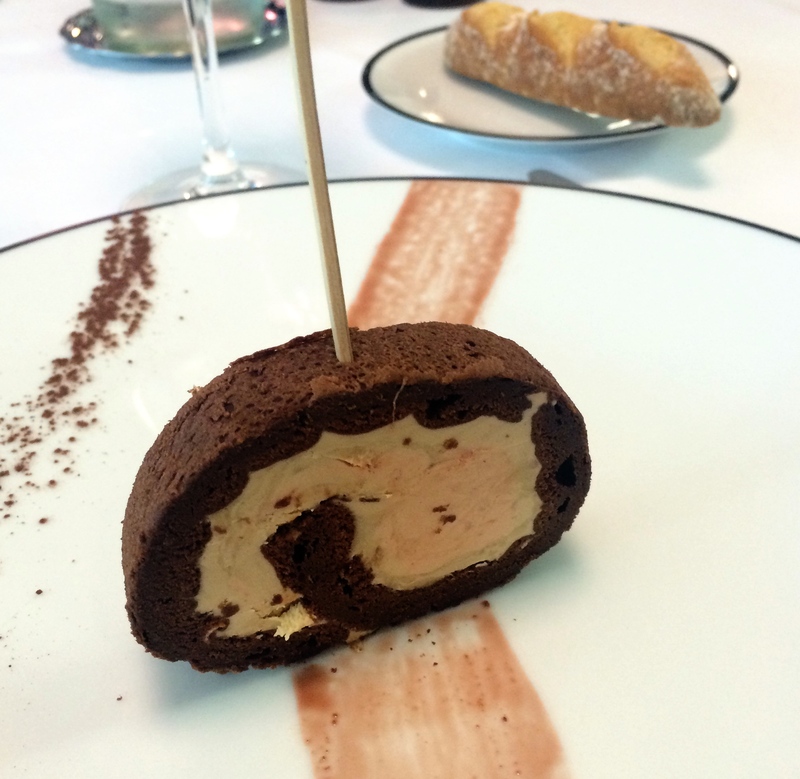 We were all a bit surprised by the chocolate crust, and my French colleagues thought it was too sweet and overpowered the flavor of the Foie Gras. They all ended up removing the crust and focused on enjoying the center. 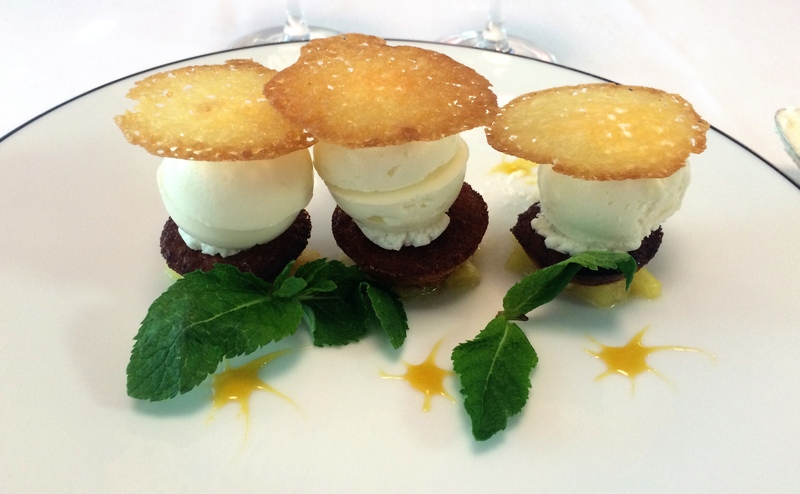 The dish was served cold and almost tasted like an ice cream to me. I’m not sure I would order it on a regular basis, but I did enjoy trying a new appetizer. 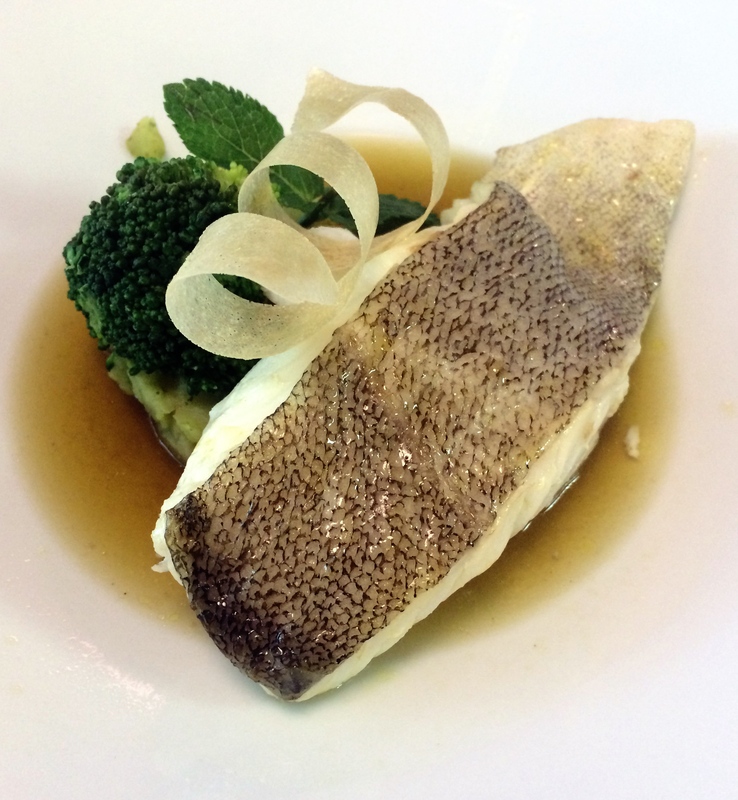 Our main course was roasted cod, served over broccoli puree. I truly enjoyed this dish. The fish was light and flaky (and the knife the French serve with fish does a fantastic job of peeling the skin right off the meat), and the broccoli puree had a thick and somewhat chunky texture. It felt like a substantial meal, but not overly filling – which is good since lunch in France is a four-course meal! The dessert we were served was not only beautiful (again! ), but light and delicious! I didn’t finish the dessert, but I did try each component and loved the flavors. This was a coconut mousse served over a small muffin (almost banana-nut-like) with a crispy wafer over it. Isn’t it lovely? To say that this lunch is way more fancy than I normally have would be an understatement. It’s also more food than I would normally have! I’m excited to share another great experience in Compiegne with you shortly. I had a wonderful young server who was all-in on the surprise, much like Ralph was in Bocholt! Please stay tuned!